Have you ever wondered about the women who came before you, the women who fought and pushed the boundaries of women’s fighting to make space for you? You may know Smith from her blog “Girlboxing” which chronicles her training at the famous Gleason’s Gym in New York City. 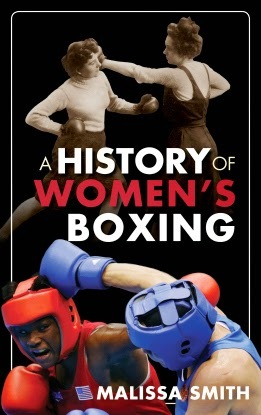 She is exactly the sort of woman to make you realise how special boxing is – a fan who boxes and brings the academic training which drove her PhD: “Boundaries in Motion: women’s boxing”.This detailed and engrossing book describes exhibition bouts and demonstrations around the globe from the 1720s onwards, even adding in the clothes worn by figure like Barbara Buttrick as they fought inside and outside the ring, Starting with English fighter Elizabeth Stokes from the Amazonian era in the 1720s, each chapter picks out the progress and the set-backs on the road to London 2012. I loved the chapter on Barbara Buttrick ‘The Mighty Atom of the Ring’ – the Englishwoman fought in the 1940s. Smith has found fascinating detail on the exhibition bouts and demonstrations she put on in her battle for recognition. I was privileged to hear Buttrick speak at the opening day of the women’s fights at the London Olympics 2012. By the time of Christy Martin in the 1990s, women were tentatively allowed inside the ropes but still nottaken seriously. Smith draws readers along the path from Toughwoman contests to the epic battle between Martin and Irishwoman Deirdre Gogarty in 1996. 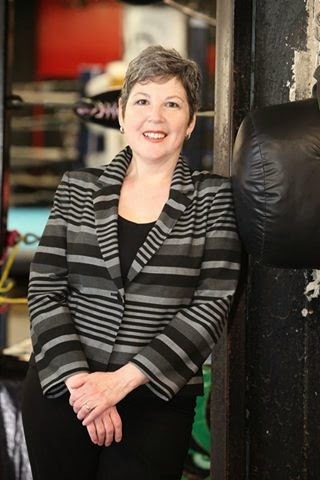 Gogarty has since written her own book, but that fight was probably the first time the sports world acknowledge that women’s boxing was here to stay. I met Gogarty on a recent trip back to Ireland – she lives in America – and she still remembers every blow. Smith describes the fight as “an exponential leap into the stratosphere for women’s boxing”. The final chapter is dedicated to amateur boxers – the Golden Gloves contest in America and of course, the Olympics with a nod towards professional MMA fighters as a new genre. Smith deftly shows how the lack of official support from AIBA and other groups meant that while women fought a demo bout in the 1904 St Louis Olympics, it was 98 years before Irishwoman Katie Taylor, Indian Mary Kom and others got their chance in London.